There's something about a new year that makes me want to organize and put away. You too? 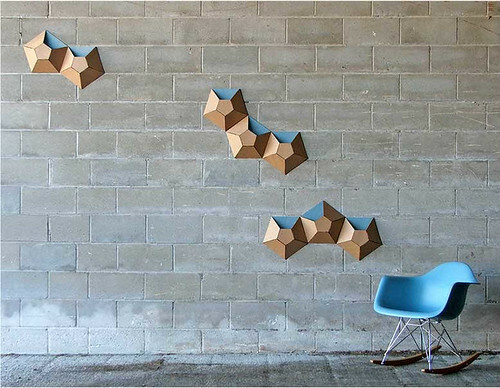 I'm thinking these cardboard-yet-classy Wallpockets would make straightening up even more satisfying. While hiding away all sorts of small objects, the recycled cardboard pentagons double as modern art. Cleverly designed by Tim Karoleff for Ampersand [edit: no longer available]. Remember, the giveaway for two packages of Box-Envelopes, perfect for mailing dimensional cards, ends this Sunday, January 8. I don't think I've seen before objects like these. I like them for their design and utility. Best wishes for the new year, Ann. You put together a wonderful Fab Friday collection, Ann! I haven't gotten one thing done, ha, but that's ok. I am full of inspiration! Happy Friday to you! What a beautiful idea to upcycle and so useful too. Happy New Year! Looking forward to even more wonderful paper art inspiration on your blog in 2012! The wallpockets are so funky!! Thanks for the links to the great window displays and the photoshoot with Yulia.